Rev Alvin Tan is a graduate of Tung Ling Seminary. High Praise Ministries was started. Prior to pastoring a church, he served as a Music Director in para-church Creative and Music Ministry. God has blessed him with this gift of ministering in worship and leading people into His Presence. He has had opportunities to serve as worship coordinator, worship leader and back-up musician in different crusades, rallies, seminars, Prayer Conferences and Praise & Worship celebrations held in Klang Valley and different parts of Malaysia. He has assisted in this area of worship for the likes of Tom Ingles, Larry Lea, Edwin Louis Cole, Bob Weiner, Morris Cerrulo, Reinhard Bonkke, Claudio Friedzon, Sergio Scataglini, Carlos Anacondia, John Bevere and has also the privilege to minister in Philippines and Nepal. 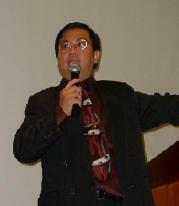 Here is a picture of Reverend Alvin Tan, the Senior Pastor for our church. His dedication to God and to our church is a strength that we all benefit from. Pastor Lynda Tan serves along side her husband with dedication and love. Together, this couple is creating a great impact for the kingdom of God.